We DO love you here at Witch City Ink, but don’t worry, this post isn’t about that. The fantastic Front Street Coffeehouse here in Salem, in conjunction with Mike’s Museum has organized a month long silent auction at Front Street. From February 1st til the 28th, you can check out and bid on art from a bunch of artists, including our own Sharonn, Steve, and Cassandra. The best part? 100% of proceeds from the show will go to HAWC, which provides services and support to victims of domestic violence who reside on Massachusetts’ North Shore. You can check out the event page on facebook right here. We didn’t get Sharonn to take photos of her works, but we’ll try to snag some while they’re hanging on the walls. In the meantime, you’ll have to head over to see how gorgeous they are in person. As usual, Sharonn has been a busy woman. Here are a couple of peeks into what she's been working on these days. This tiny barn owl was a walk-in that Sharonn was able to fit in at the end of her day. She doesn't usually have extra time, but the client happened to come in at the perfect moment! The beginnings of this pretty lady is on the back of one of Sharonn's good friends. It suites her perfectly! Of course, since most of you don't know her, you'll simply have to take our word on this. And here are the beginnings of pretty lady #2. She's a little more modest than pretty lady #1, but equally swoonable. Sharonn is booking out until the end of May right now, but she is available for consults before then. Give us a call at 978.744.9393 to set something up with her! Welcome Paul Martinez to Witch City Ink! We have been searching far and wide for an artist to join our shop after PJ's departure. We are very selective when it comes to the artists we want here at our shop, but we finally found someone! Let us introduce you to Paul Martinez, who we have stolen away from the vast wilderness of Vermont. Paul has been tattooing for about twenty years in various locations on the east coast, and has a degree in graphic design. He can tattoo any style, but like the other Witch City artists, prefers custom work with his own stylistic touches. Here are a couple of examples of his work, and be sure to take a look at his portfolio for more. If you would like to book an appointment with Paul, please call the shop at 978.744.9393. 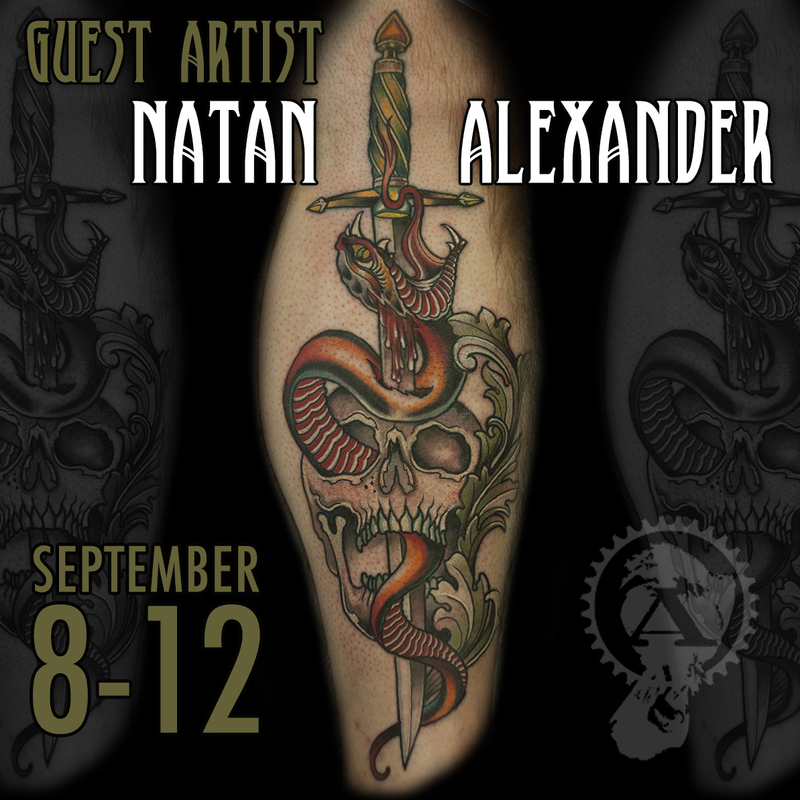 With the Boston Tattoo Convention less than six months away, Natan’s schedule is getting fuller. If you need to schedule an appointment with him to continue an existing piece or start something new, we recommend doing so as soon as you can! Give us a call at 978.744.9393, and we’ll get you in his calendar.